Electrical remodeling in Houston and Lighting Remodeling of existing facilities is another area where our expertise shines. 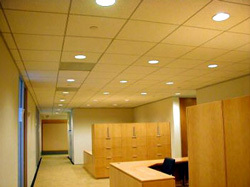 We have been remodeling Houston businesses for almost 25 years. Please give our friendly remodeling experts a call today at 713-266-6464 to discuss your upcoming project. Whether you have a remodeling project designed simply for aesthetic reasons, or one designed to reduce your electrical consumption and improve your bottom line, the professionals at Highlights Electrical can show you the way with the most modern, energy efficient, and design friendly alternatives available in today's marketplace. Since 1986, Highlights Electrical has been providing construction planning, electrical and lighting design and implementation strategies for business leaders, facilities managers, and General Contractors across the Greater Houston Area and across Texas. If your facility needs a facelift or a major overhaul, we have the team to get the job done right! Today, the modern facility has many more available solutions to choose from. Fashionable, visually appealing and functional lighting are no longer mutually exclusive. We consult with architects, engineers, contractors and planners alike to pursue and develop strategies to bring older facilities up to modern day standards. Devices such as occupancy sensors, ambient light sensors and new technologies like LED lighting and Induction Fluorescent Lighting make it very easy to beautify your surroundings and in keeping with today's “green” initiatives, make them much more energy efficient as well. Energy Management systems are currently a major focus in the industry. We are certified installing contractors for the Odyssey System, one of the most advanced energy management systems on the market today. If you are in the market to reduce your energy consumption and improve your bottom line, you should contact us about Odyssey. Whether your remodel is purely cosmetic or an attempt to take control of your electrical consumption, please allow the helpful and professional Staff at Highlights Electrical to assist you in your endeavor by calling 713-266-6464. We can design a system based on your budget. We know you will be pleased with what we can do for you!